Trek’s Soho DLX ranks as a fail in my repertoire. I prayed it it would be the ultimate commuter bike for the winter, but alas somethings are too good to be true. This is a sweet, sweet ride. An upright, sporty commuter bike, metal fenders, a bike rack, disk brakes, a rubber bumper on the top tube and an 8-speed internal hub. Even the dollar-store coffee mug looks good. BUT Trek should have stopped there and left out the belt drive for their northern friends (MEC stopped there). Like the coffee mug, it wasn’t built for the great white north where weather routinely reaches -20 Celsius and fresh snow is a biweekly event. Riding home from my purchase, the cold cracked the glue causing the stainless steel lip to fall off the mug, revealing that it was really a plastic cup on the inside (I doubt it’s bisphenol A free anyways). I am in search of the holy grail of winter biking, it’s a religious quest! I want a bike that’s resistant to the snow, ice and salt. I’m lazy, I just want to bike. I don’t want to spend time in the shop freezing my fingers off. However, a working bike is better than a $1350 bike that can’t go in the snow! It’s a design flaw. The problem is that the rear sprocket has sealed grooves. So when there’s fresh snow spraying up from the tires it fills the grooves slightly and pops the belt off. It doesn’t help that there’s no guide keeping the belt in place. It makes this bike useless when it snows, which in Canada makes it heap of junk from December through March. It happened on the Soho’s second ride. With about 200 meters to go, I heard a grinding noise. I looked down and sure enough the belt had fallen off. Dismayed I tried to pop it back on, but it continued to pop off. At 100 meters I just walked the bike to work. I read a review from a person in Calgary who mentioned this happened when it snowed. I should have believed them, sometimes the internet is actually correct. Then a week later the belt drive on my DLX Trek Soho fell off again. This time it happened 200 meters into my commute. I had left work with 45 minutes to meet up with colleagues who were visiting from our head office in Antwerp. We were meeting for a dinner which I had planned. After it fell off, I wasted 20 minutes fiddling with the belt, putting it on like 40 times before giving up. I ran the rest of the way home, pushing the bike through the snow. I swore that I’d never again rely on this belt drive again. I was 30 minutes late for the meeting, having taken a deodorant shower. I’m finished … with belt drives. provide a sealed enclosure for the belt drive (dutch style), but then why not do this for a chain. I bought this bike at Ziggy’s Cycle, who don’t officially accept returns. That’s not a customer friendly policy, but I guess I can understand that returns could be pricey for a small independent dealer. Maybe it’ll be a reason why MEC’s new bike sales will succeed, they actually accept full returns. Ziggy’s has treated me well in the past, so I’m expecting they’ll be calling up Trek on my behalf. I’ll be providing periodic updates in my quest to get a winter bike back on the road. As of today the bike is sitting at Ziggy’s Shop. Until a bike is up and running you’ll see me running as my main transportation mode, keeping my road and mountain bikes out of the salt. I’m willing to change my mind on the Soho, but it’ll take a heck of a lot. Any satisfied Soho winter riders out there? @michaeldruker Did you order it from the site you’re mentioning? The price seems cheap, especially if it lasts a couple decades! How many gears does it have? No, I ordered it from Dutch Bike Co. Seattle (and actually had it shipped to the States). Cheap it wasn’t, but all my bike gear was under two grand; I think it’s worth it precisely because it should last for a while. Curbside in Toronto may be able to get these in, but no local shop seems to want anything to do with real European city bikes. It’s a Shimano Nexus 8-speed, which is scarily silent. oh no! 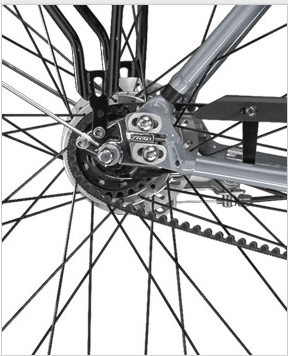 I had been wondering if belt drives would be great for the winter….apparently not. MEC didn’t stop before the belt. They have a bike for $1250 in their winter catalog this year that added it. That’s what led me to the idea of the Trek Soho DLX. I’m waiting with bated breath to see how well (or not) the solution of the new cog that Trek sent you works out before I buy one of these bikes. Test ‘er well for us all, man! I also just bought the Soho DLX. Haven’t ridden in snow yet because it is spring here in Colorado. Thanks for the review. I’m a bit concerned now, but will see what next winter brings. Yikes. I just want a maintenance free bike, too. Gates realizes it’s a problem and I’m guessing we’ll see it addressed in the future, for now it’s a product defect for sure. 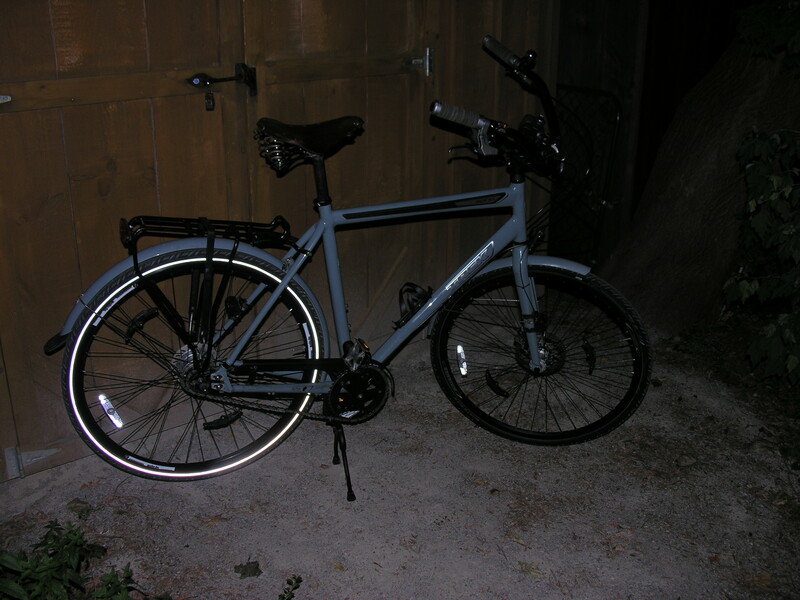 I bought a 2010 Trek Soho with the Gates Carbon Drive in May 2010. We don’t have a lot of snow here, so I never had the problem of the belt falling off. The problem I do have is also bad. I can’t climb any hills with the Soho. As soon as more than a little pressure is applied on the pedals, it goes crunch, crunch. My local bike shop has been friendly and it’s been there 5 times. Fifth time: belt replaced with chain, now it works! I’m going to test ride the replacement bike with the belt and we’ll see. Thanks Karl, a few questions just because I’m curious. How many kilometers did you get on the Soho before you ran into problems? Just to confirm, it wasn’t the nexus hub? Also did you ask for a full refund? And final question where did you purchase the soho? I used this Soho without any problems whatsoever from May – December 2010. My daily commute is 10 km round trip plus I went on a week long bike trip with the family in the summer. My commute goes via 3 km of gravel. I also rode in the snow, but the snow was never deep enough to be a problem like you mentioned. Let’s assume about 1000 km (commute plus weekends). My spare bike that I ride to/from work is a cheap, steel beach cruiser with fat tires and a coaster brake. Since December I haven’t been riding the Soho since as I described, it was always in the shop. The five times I mentioned have been over four months. Trek had this bike for about a month several times. It does have the Shimano Nexus. I think Trek was arguing with Shimano about who was to blame. The dealer today told me it was the problem of the Cog connecting to the rear hub. Anyway, they have offered me the DLX version (with disk brakes) as a free-replacement. If it works, I’m very happy and I think I’ll end up buying a road bike from them as well. I live in Switzerland. All’s well that ends well. If they end up giving me a new bike (higher specs) that works, I’m happy. I’ll let you know what happens after I test ride the new bike. The dealer gave me the new Soho DLX last night. I took a quick ride up a very steep hill, and it worked fine. I put as much pressure on the pedals as I could, and it was fine. The dealer told me to ride it for a week or so and if I like it, he’ll send my old Soho (which now has a chain) back to Trek. While I’m using this new Soho DLX, I have none of these things. I usually keep my bike outside the office where everyone else keeps the bike. Since I now have neither a lock nor a kick-stand, I can’t. Karl, the difference you describe between Europe and North America wrt bikes is absolutely accurate. The North American view of bicycles is that they are a hobby and somehow optional. So if something is flawed in the design, no big deal. If the bike sits in storage for 3 months while they figure it out. This cultural mindset of cycling is one that a few people are trying to change (cycling advocates, urban planners, environmentalists and cycling enthusiasts). I hope to do a few more posts on this topic. It’s why Trek / Gates won’t stand behind their product and offer full refund when their product doesn’t work. Notice their prototype rear cog is a stainless steal alloy and not carbon. After a month with the carbon rear cog it was completely chewed up, I couldn’t see it lasting more than a full season or two. Now that I’ve switched to a chain, I’m satisfied with the bike, but I could have purchased this bike from many different manufacturers for a lessor price. Even though it’s missing a few components like a lock, kick stand and lights I was just thrilled to be able to purchase a bike that had a rack and fenders designed for it. Most bikes sold in North America don’t come with fenders or the rack and you have to purchase after market components which often don’t fit very well. My Saga continues. I’ve now had the new Soho DLX for two years and the same problems are returning. While pedalling easilly on the flats, there are no problems. As soon as there is more pressure on the drive-train (going up any kind of hill), CRUNCH, CRUNCH, CRUNCH. I can’t see if it’s the belt slipping or the internal hub slipping some how. This was exactly the same problem I had with the preveious Soho which Trek replaced after five months of screwing around. I’m thinking of replacing this bike with a simpel. http://www.simpel.ch which has an internal Rohloff Speed hub which I think is better than the Shimano Nexus. I don’t want to have to go back to a chain but I need to be able to ride up hills. (This is Switzerland). We’re thinking of moving further up the hill and my 5 km flat commute would turn into a 10 km hilly (500 m vertical) commute. I’m going to take the bike back to the shop and we’ll see what they say. P.S. I’m also going to have my winter tires taken off. (Continental Winter). These tires are great on snow and ice. I slipped on the ice in a curve before I had these mounted in early December and fractured my shoulder. I still have pain. I’ve had a trek soho since 2007 no problems to announce, works perfectly…had to tighten the belt once but otherwise it has been a dream! The problem you encounter is a bit region specific…it seems a bit harsh to tar the bike because it can’t handle canadian snow! Strangely enough I didn’t have any problems in slushy snow/grit a couple of years back when we had a couple of freak snow storms. One thing I would say though…you would be best getting yourself a 1950s bike with full covered chain (a bianchi perhaps? ), because by the sound of it weather is always going to be an issue. I don’t really understand why the full length chain covers went out of fashion! ok its a bit more weight, but frames are made of alluminium now anyway, so we have shed weight everywhere else on the bike…for the weight of a couple sheets of pressed alloy would it kill bike manufacturers to offer it? @Jimmy, Glad to hear it works for you! It doesn’t seem harsh at all to tar this thing. I find it harsh that I couldn’t get a refund for a defective bike. Here in Southern Ontario we can get snow from December to March. I ride a bike 365 days of the year. The belt came off on my 2nd day of ownership. I asked for my money back and both TREK and the Ziggy’s (the cycle shop) refused. That I find unbelievable. The bike was sold and marketed regional and both firms wouldn’t stand behind their product. If either Trek or Ziggy’s would give me a refund I would definitely purchase a ‘Dutch’ styled commuter with an sealed chain cover. Seeing they didn’t and replaced the belt with a chain I’ll make do. Now that I’m part way through the summer, I need to take the Trek Soho in for a tune-up the nexus is not behaving itself. Not to mention there seems to be a lot of drag in the hub. I’ve compared it to other bikes with nexus hubs and mine does not spin as freely. I really noticed it when I did a hilly 20k loop and my buddy would fly by me coasting. There is a modifcation that cures the snow (or mud) build up problem and the slipping under pressure problem. The problem was the Gates cog whish was originally Aluminium and much too soft for the job. The new steel version which should be available from Trek is also an open design which should not clog up. I also have the Soho and the bike is perfect.I’ve had no problems riding the bike 365 days a year in Canada!! Sounds like dude is just trying to get his money back because he’s changed his mind haha. I just don’t see why you wouldever consider buying a bike from a shop that doesn’t stand by it’s customers. Did you know about their return policy before you bought the bike??? I bought the Trek DLX 2011 early january this year and I’ve been biking to an from work five days a week, about 15 kilometers a day. I’ve actually not experienced any issues at all with the belt, having the same rear sprocket as you have. January – february gave me just about every weather possible, including a short stint of -21 degrees Celsius without any issues. Snow has been plentiful. I’m thinking your issue might have been the belt not being tensioned enough? Combined with the closed sprocket that might make it prone to belt-popping? However I did have problems with the internal gears. The Shimano Nexus broke down completely after about three weeks, with a horrible “pop” (http://youtu.be/9DZdHhRpEJM). The shop replaced it, and also felt fit to replace the rear sprocket with a new one with open grooves and a “guide” to keep the belt on. I think this might be the standard on the 2012 Trek DLX, but I’m not sure. So all in all, I love the bike, its a great commuter bike and so far it works well here for me here in Sweden. I’m quite pleased with my 2012 Trek Soho Dlx which I purchased in Sept 2011. However, I did make a modification after having some problems during the first couple of months commuting. I live in Calgary and commute about 21 Km daily, year round. My first problem came when the front belt sheave fell off! The five screws that hold the sheave to the pedal spider did not have thread lock compound and worked loose in a short time. When it came apart There was only one screw left, the other four were scattered somewhere along the wayside. Unfortunately I did not buy the bike in Calgary and the local Trek dealer would not cover this under the warranty. That cost me $25 for the set of screws and I installed them myself or the cost would have been another $25. Next, the drive belt broke! It was snowy and the road crews had spread pea gravel to improve traction for cars; I use studded snow tires so tractionis not a big concern to me. But, the belt failure was due to pea gravel being kicked up with the snow by the front tire and some of this mixtue falls on the belt and is carried to the rear drive just like a conveyor belt would do. Of course the Calgary dealer would not cover this repair since I didn’t buy the bike from him, but he did get a replacement belt from Trek and sold it to me for a reduced price so that this cost me $25 and I had to install the belt myself or pay an additional service charge. At this point I was not impressed with Trek’s warranty policies as it doesn’t matter where the bike was purchased as far as product quality by the manufacturer is concerned. The flaw, as others have noted, is the lack of a fully enclosed belt guard. I inquired about such a guard when I ordered the bike, but such was not available. So, I built a guard and have had no problems since with about 3000 km of year round commuting with plenty of snow, ice, pea gravel, dust, and water. It would be good for Trek to offer a fully enclosed belt guard as standard, or at least as an option. But I’m not one to complain and wait for the obvious when it was not much trouble to build my own guard and put the problems behind for good! The bike is a real delight to ride and now the maintenance is virtually mill as I had hoped when first considering this bike. I’m happy for you John, I think you’ve got an updated gates drive from my 2011 one. My biggest disappointment is in Trek’s customer service … I’ll never buy another Trek nor recommend it. Again glad your purchase is working out for you! I have owned a Trek SoHo DLX for coming up on 3 years now. I live on Canada’s East Coast in a city that gets a lot of snow and a lot of Winter storms. We also routinely have cold Winter weather. Before I go any further I should point out that, by its very design, e.g., full wraparound metal fenders and 700×28 tires, the SoHo is obviously not a heavy snow bicycle and, being a cyclist in several forms for nearly all of my 48 years now, this was obvious even to me. If you want to ride in heavy snow, do what any other thinking cyclist does and build a Winter beater bike – something with studded wide tooth tires, no fenders for snow and ice to build up in, a fully upright riding position, and no gears. My new SoHo had drive train issues as soon as zero degrees Centrigrade hit, regardless of whether there was snow, so the issue was simple to deduce: the belt drive. I emailed Trek Canada and they were very helpful. The shipped a new redesigned entire drive train to my local bike shop and had them install it or free. It solved my problem completely. The new cogs and belt are notched so that the belt does not slip (the “crunching noise” someone complained about) and the belt now does not come off in cold or snowy weather. I still commute an 18 Km round trip each day to work and I have an estimated 2100 Km’s on the new drive train. I do still have a winter beater bike as well, however, for the reasons I outlined above, however. If you have a problem with a new bicycle, I recommend contacting the manufacturer – I have found you get results far faster than just blogging about it. I also recommend looking at any new bicycle purchase with a critical eye: is the bike what you need for the style of riding you want to do? Will the bike be able to do what you want it to do? I have traveled (and ridden bicycles) in several countries in Europe and I have seen zero huge advantages in bicycle design on either side of the Atlantic, however, I have experienced some very different riding conditions in Europe : large smooth, frost heave free, paved bicycle/pedestrian paths, for example, in Finland, Sweden, and some other countries. Comparing North American bicycles to Euopean bicycles and making a blanket statement that the bikes are better here or there is not accurate, in my opinion. How long had you had your bicycle before Trek sent you a new belt system? I assume you upgraded to the center track belt. My bike has the older belt technology. I do have the slipping problem “crunch” “crunch”. After reading your story, I’ve regained hope. I’m not sure Trek Switzerland or my local bike shop will want to pay for a new belt system. I imagine the new belt plus the front and rear cogs could cost $300-$400 plus installation. Toine – would you be willing to write a guest post review of your experience and the updated drive? It would be great to post alternate ending? We’d need some pics of the updated drive. Forget this garbage for winter commutes… just buy a Fat Bike. Everything is built tough, everything is sealed from the elements and the tires go through anything. Even summer months this bike is a very capable rig and will move as fast as my hybrid (that still with snow tires, not even fat street tires) All around fun and unbreakable bikes. Like everyone here, I’ve had endless problems with the belt drive / Shimano gears on my Trek SoHo DLX. It’s basically crap. Every year it has to back to the shop for a £50 ($85) oil dip and three years on it’s now totally f*****d. It’s a total rip off. I’ll never buy another Trek bike. They did some dumb things with this bike – the brakes and the gears are the two I hate the most, but I’ve never got on with the horrible squashed up frame angle. 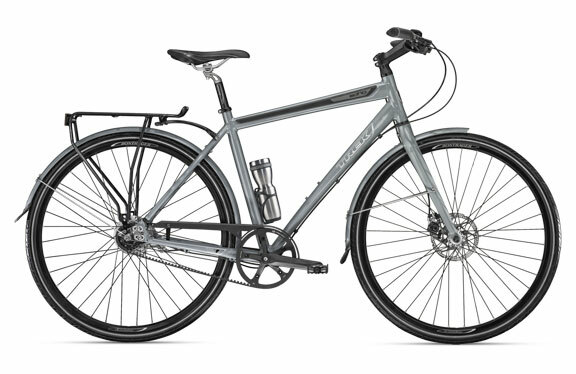 I’m now looking for a decent European bike for commuting with fully weather-proofed, sealed internal gears, something that is genuinely designed to be maintenance free. The Trek SoHo DLX has frankly been a total waste of my money. I can’t believe how much money I had to spend on it to make it suitable for commuting, from adding hub dynamo + new front wheel to its expensive annual shop maintenance that you can’t do at home. By the end of three years, I could easily have bought a good European bike that would have given me trouble free commuting that I could maintain myself. No surprise at all to see Trek have stopped selling all their belt drive bikes this year. Shame as it was a good idea, but they just don’t work. Previous Previous post: Does Waterloo Actually Have Bike Lanes?